A few months ago there was a story all over the news about how creepy clowns were all over the place, scaring people and threatening them with weapons, and hanging out with windowless vans to lure children. The police immediately sprung into action, cracking down, tracking down every lead, and issuing warnings on TV and other news that this clowning around would not be tolerated! Here in my home state of Ohio, several police departments warned you could be charged with multiple offenses, including trespassing (wha? ), menacing, inducing panic and disorderly conduct. Great job, guys! You bravely served and protected us from... well, from nothing. There wasn't actually anything going on and certainly no real "clown threat". The New York Times reported that all the clown sightings were mostly hoaxes... noting that there had been twelve arrests and strangely pointing to a singular instance of a sixteen year old boy who'd been stabbed to death by a man wearing a clown mask, the headline of which should have been "boy murdered", not "boy murdered by clown". The assailant could have been wearing just about any kind of disguise. If he'd been wearing a ski mask, would the headline read "boy murdered by winter sports enthusiast"? I guess we could give a thumbnail synopsis of the Friday the 13th movies as "Wayne Gretzky on murderous rampage". And while both the Daily Show and the Late Show covered this bizarre incident, neither of them picked up on this particular irony. 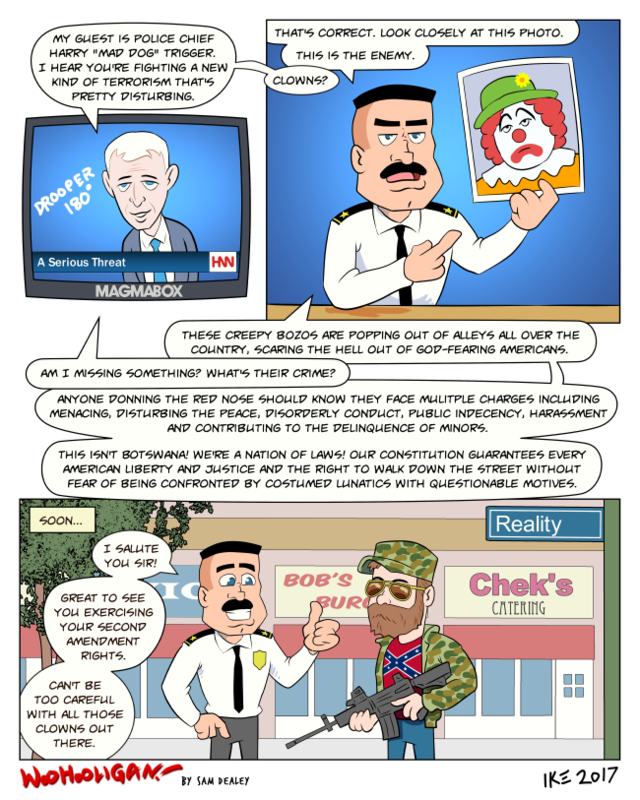 Here are all the cops leaping into action, running down clown reports on the mere suspicion that something might be going on, only to discover that it's nothing. Meanwhile we all know that people are dying in gun violence every day and the entire government machine responds with a resounding shrug. And isn't that a fantastic metaphor for the new Trump presidency? All this "American carnage" that doesn't really exist, while they ignore the real problems by eliminating people's mortgage forgiveness, trying to cut our health insurance, pulling out of Paris (she's a 6 at best), etc. But for all this doom and gloom from the administration, I actually have a lot of hope. The women's march is so encouraging, because it shows that despite problems at the top, the grass roots are fighting back. The truth is we all really need to get involved, to support #theResistance with new local and state candidates, or if there's not one, get out there and run your damn self! I got into an argument on Twitter the other day with a guy who was complaining about people calling out Trump's press secretary for blatantly lying about the size of the inauguration crowd, saying without irony that "you can't call them out because that's divisive and we need unity!" Ha! Lying is not a partisan issue. There aren't people on either side of the aisle who say "you know what would be great? More lying in government!" No, we're all pretty unified in being fed up with the lying, and we should all keep calling it out. As Martin Luther King said, if you don't take a stand, you're already dead. So rise up! Resist! Also, if you enjoyed this, check out my previous page on guns in schools, with a much longer commentary on the subject of gun violence and 2nd amendment rights in general. And remember that if you enjoy these comics, please consider supporting them on Patreon, to keep me making them. Stay awesome, Hooligans! @DagnyRed Using photos from the front of the crowd is like calling a Geico commercial a 2-hr film because it fills the whole screen.